Discussion in 'Henshin Justice Unlimited' started by SamuraiEchidna, Apr 9, 2019. Welcome to the discussion thread for Dinoknight Sentai Ryusoulger, episode 04; "Dragon and Tiger!! The Fastest Battle". This week: Towa and Bamba begin searching for their Kishiryu partners before learning Koh has a map to the temples holding them, with the former challenging the red warrior to a duel over it. The ensuing rivalry soon becomes detrimental when a Minosaur starts putting people to sleep. In this week's episode: How to give Bamba a migraine. In some ways, I think this episode was kind of self aware, but I'm not sure that saved it. We all knew Green and Black were going to join the team anyways, so instead of having a super serious battle only for Green and Black to learn they were wrong for being loners, the show creators decided to have fun with it. I wouldn't say I was entertained by the games Towa and Koh came up with, but it's different to say the least. I just hope that these two don't constantly have these duels/games to see who the best is despite being on the same team. I've seen that in other shows, and it's not entertaining. Bamba seems to reflect what I felt about Towa. Despite looking down on them, Towa is such a goofball on his own that he fits right in with the main three. I was wondering why the two of them even travel together, until the episode gave me the answer. They are brothers, and apparently family means something important to Bamba. Either way, he's be having to change everything he's done up til now. He's had to play nice with the other Ryusoulgers, even though he's use to going it alone. He's had to try defeating the Minusaur outright instead of killing the host human. And apparently, he had his Kishiryu partner all along, but he found out treating it like a friend is faster than trying to tame it into obeying. Where in the world did he get the impression to operate this way? There's no way his previous mentor told him to do all this, is there? Also, just a minor thing, but did this MOTW look like it was maybe based on those insect monsters from Starship Troopers? So are there going to be any actual plots or is it just going to be monsters attacking random people for no reason whatsoever and rangers acquiring new mechs? Usually there are a least motives behind the monsters attacking people or things. Like why the hell was the father the one to create the monster of the week? Also, what is going on with his son? Was his son injured in an attack? Is he a sickly boy? Also, how did the rangers even assume the kid was the host? Is he the only sick kid in the entire country? Sure, they made a one off comment that the dad works a lot, but what does that even mean? How does that relate to the show at all? What is happening? All I'm watching is a monster shooting at people and rangers fighting it, and then it grows off-screen and we have a mech battle. The only thing I can say I liked about this episode was it looked like they gave Ed 209 a pair of Super Soakers. Yeah, this wasn't a terribly interesting episode. I got Den-O/Wizard vibes -- heroes taking the backseat to underwritten, sob story guests you don't care about, and not doing much to help them until the episode needs to wrap up. Making monsters from humans is an interesting idea, but not done in this way. Green remains completely unlikable, I don't know what the writer's trying to do with him. We're supposed to be like "Aww!" by the end of this episode, but he's still a nut. The Ryusoulger should kill him before it's revealed he's the head Druidon and save themselves some trouble. ^from all this, it looks like I made a right call to rewatch Dekaranger instead of checking out Ryusoulger right now. Depending how things go over the next few episodes, we may decide to just start watching Ex-Aid instead. Like why the hell was the father the one to create the monster of the week? [...] Also, how did the rangers even assume the kid was the host? Maybe you need the be wide awake in order to be a host? As for your other question, when the Rangers encountered the monster in giant form for the first time, they noticed that it was acting like a kid that just wanted to play. This made them assume the child was the host at first. Turns out, it was the dad, who's deepest desire of getting another chance to play and make memories with his son was reflected in the MOTW. As for the rest of what you're asking... ¯\_(ツ)_/¯ I was mostly on autopilot watching this episode. It was more about Green and Black than it was about the monster. 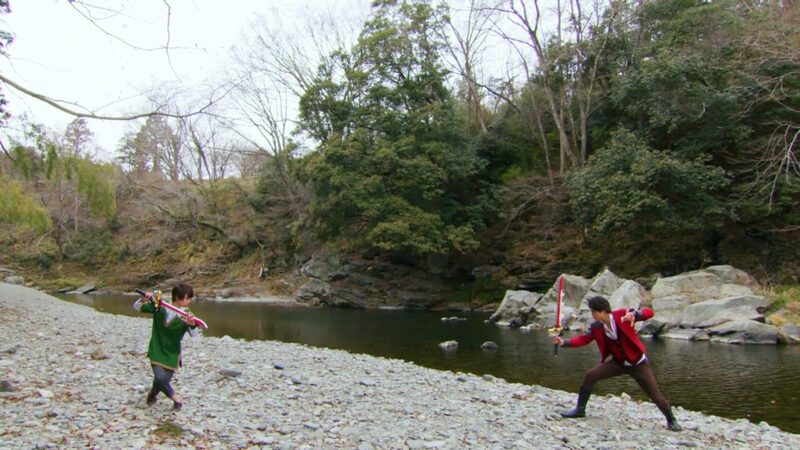 I can only assume the rivalry between the Ryusoulgers and the Druidons will be expanded on in future episodes, thus making the motives more clear. We haven't even seen Gaisorg yet, so anything can happen right now.